Flashlight / Batteries / Bulbs. FRS / 2-Way Radio Batteries. Remote / Car Alarm / Lantern. 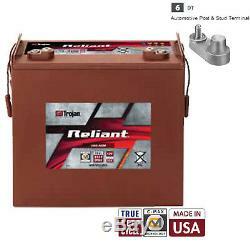 Trojan Reliant J185-AGM 12V 200Ah Deep Cycle Sealed AGM Battery Made in USA. Trojan 12V Reliant J185-AGM Deep Cycle AGM Battery w/ C-Max Technology. BATTERY SHIPS WITH DT-6 TERMINAL TYPE. The Trojan 12V Reliant Deep Cycle AGM Battery with C-Max Technology is made in the U. And features design elements that offer a new direction in Absorbed Glass Mat (AGM) technology. 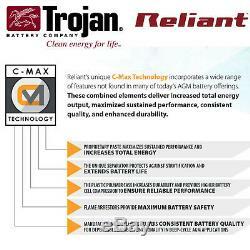 Reliant's unique C-Max Technology incorporates a wide range of features not found in many of today's AGM battery offerings, including a proprietary paste formula, unique separator, special polymer case design and maximum flame arrestors. These combined elements deliver increased total energy output, maximized sustained performance, consistent quality, and enhanced durability. Trojan&###xEF;&###xBF;&###xBD;s Reliant AGM maintenance-free batteries can eliminate downtime and increase your return on investment. With a durable design capable of delivering deep-cycle performance, an extraordinary cycle life, and superior support, you will experience the exceptional Made in the USA quality that Trojan Batteries are known for. Trojan 12V Reliant Deep Cycle AGM Battery with C-Max Features. Proprietary Paste Formula designed to address the needs of deep-cycle applications. Unique Separator Composition designed to ensure high compression for effective contact between glass mats and plates. Plastic Polymer Case Design with reinforced case end walls. Maximum Flame Arrestors features one flame arrestor each cell to provide maximum battery safety. Manufacturing Excellence that delivers consistent quality for dependable functionality in deep cycle AGM applications. 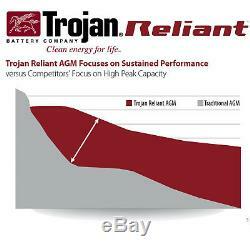 Environmental friendly - Trojan batteries are 97% recyclable. Through Trojan's partnership with Southern California Edison, it saved 8 million kilowatts hours and cuts emissions by over 12 million pounds. Trojan 12V Reliant Deep Cycle AGM Battery with C-Max Technology Specifications. 5 Hour Rate: 157 Ah. 10 Hour Rate: 171 Ah. 20 Hour Rate: 200 Ah. Terminal Type: DT, M8, M8 w/LT adapter. Reliant AGM Key Markets and Applications. Since 2004, Batteries In A Flash has served hundreds of thousands of customer worldwide! Will be processed on Monday. We will make every effort to correct your order in a reasonable amount of processing time. Should you have any questions regarding our policies please contact our Customer Service Specialists. Our customer service is here to help you. We can assist to help you finding the correct product or cross referencing your product. 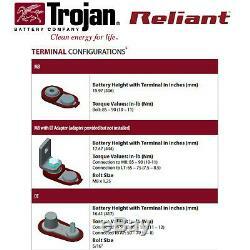 The item "Trojan Reliant J185-AGM 12V 200Ah Deep Cycle Sealed AGM Battery Made in USA" is in sale since Friday, January 11, 2019. This item is in the category "Consumer Electronics\Multipurpose Batteries & Power\Rechargeable Batteries". The seller is "batteriesinaflash" and is located in North Las Vegas, Nevada.